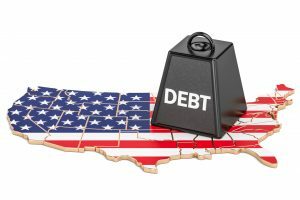 The US is officially $20 trillion in debt. Over half of that $20 trillion was added over the past decade. The annual deficits will soon be at the trillion-dollar level when projected spending is factored in. Basically, the US is going broke. How do they get out of it? For elites, there is really only one way at this point—inflation. There was little inflation over the past several years, and the Fed printed about $4 trillion. But it could cause inflation easily by announcing that, effective immediately, the gold price is $5,000 per ounce. It could make that new price stick by using the Treasury’s gold in Fort Knox and the major US bank gold dealers to conduct open market operations in gold. They will be a buyer if the price hits $4,950 per ounce or less and a seller if the price hits $5,050 per ounce or more. They will print money when they buy and reduce the money supply when they sell via the banks. This has happened in the US twice in the past 80 years (1934 and 1953). History shows that raising the dollar price of gold is the quickest way to cause general inflation. If the markets don’t do it, the government can. But what people don’t realize is that there’s a way gold can be used to work around a debt ceiling crisis if an agreement isn’t reached in the months ahead, and Rickards outlines the method here. We don’t know if the US government is working on the gold trick, but it’s suspicious that Treasury Secretary Mnuchin recently went to inspect the Fort Knox gold. He was only the third Treasury secretary in history to visit Fort Knox, and the first since 1948. The visit was highly unusual. The real message is that the solutions to current debt levels are inflationary. They involve a dollar reset, or a dollar reboot. That means revaluing the dollar either through a higher gold price or marking the gold to market and giving the government money. All the signs point to higher inflation. It’s the only way to keep America from going broke.